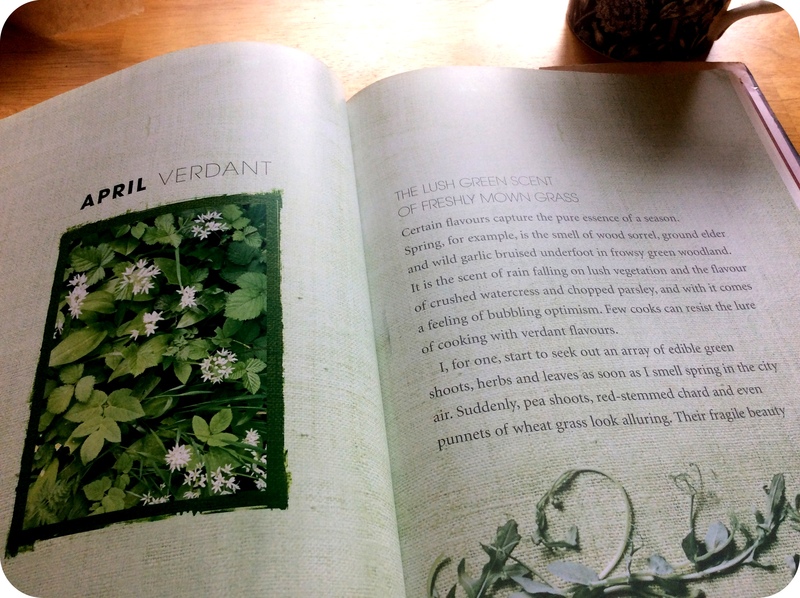 You can buy watercress and other cress, but it’s more fun to grow your own. There are many different kinds, but I wanted to grow the same kind as Milly-Molly-Mandy. 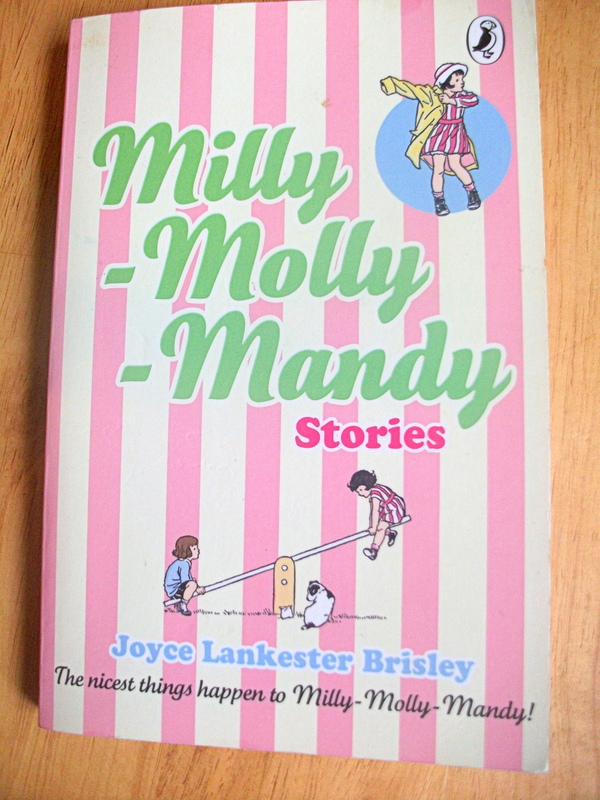 I have this very cute pink and white striped copy of the Milly-Molly-Mandy Stories. The second story in the book is entitled “Milly-Molly-Mandy Spends a Penny”. 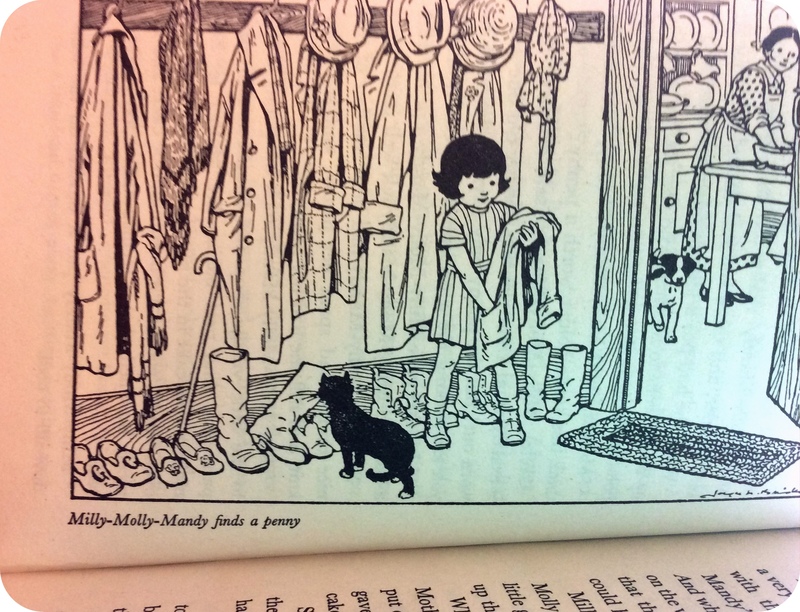 In this story Milly-Molly-Mandy finds a penny in the pocket of an old coat. She asks her family what she should do with it, and they all give different advice: put it in the bank, buy a skein of rainbow wool and learn to knit, buy some seeds and grow mustard-and-cress, buy a little patty-pan and make a cake in it, save it up until she has three and buy a baby duckling, and get some sweets. 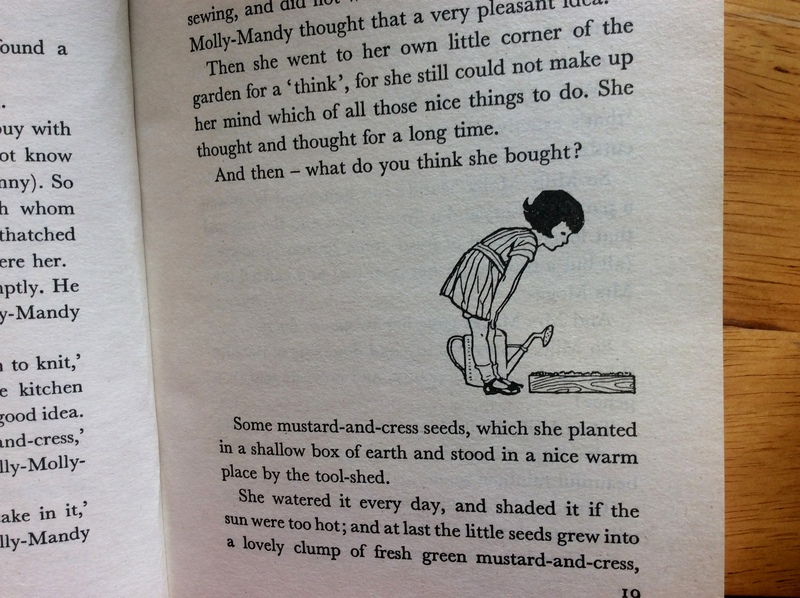 In the end, Milly-Molly-Mandy buys some mustard-and-cress seeds, which she plants. 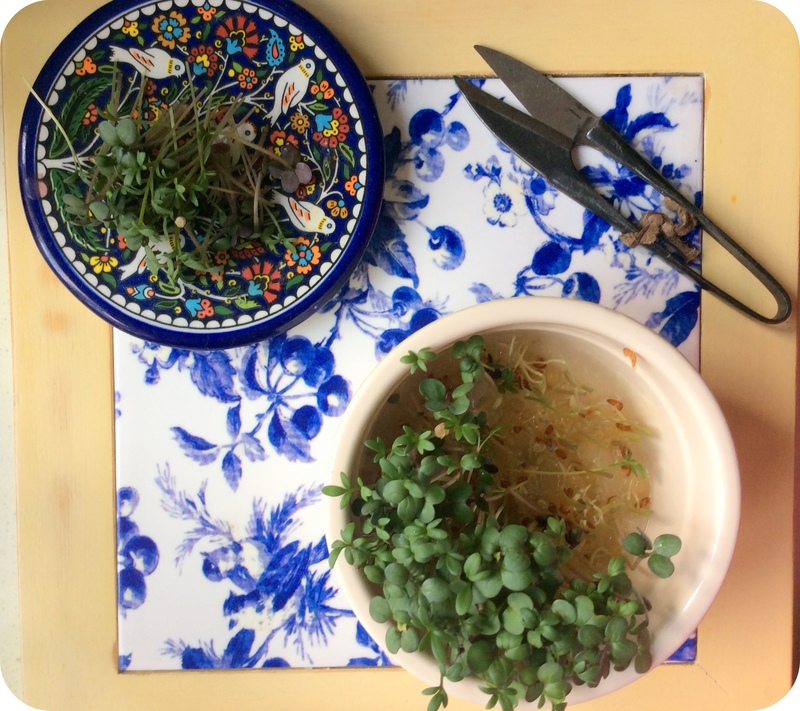 At last they grow into a clump of “fresh green mustard-and-cress, that made you quite long for some bread-and-butter to eat it with.” Milly-Molly-Mandy sells the cress to her neighbor for twopence, and then uses one penny to buy some rainbow wool. She asks her grandmother to teach her to knit a kettle-holder. She sells the kettle-holder to her mother for one penny, uses the penny to buy a shiny tin patty-pan, and bakes a little cake. That day, a lady cyclist stops by Milly-Molly-Mandy’s cottage and asks for a glass of milk, and the patty-cake looks so good that she asks if she might have that too. Milly-Molly-Mandy gets a penny of what the lady pays for the milk and cake. 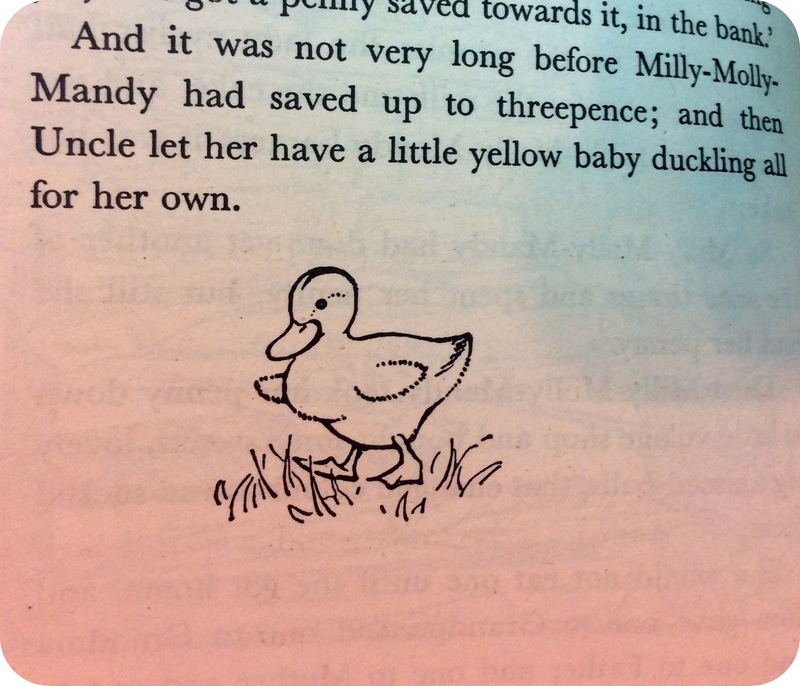 The story goes on in this way, and Milly-Molly-Mandy manages to do everything her family suggests, and in the end puts the last penny in the bank to save up for a duckling. This is very cute story for all ages which also has a good message about the good use of money. Milly-Molly-Mandy’s patience and sensible use of her penny enables her to get all the things that she wanted. You probably can’t buy most of the things she buys for a penny anymore. But you can still get mustard and cress seeds for cheap. 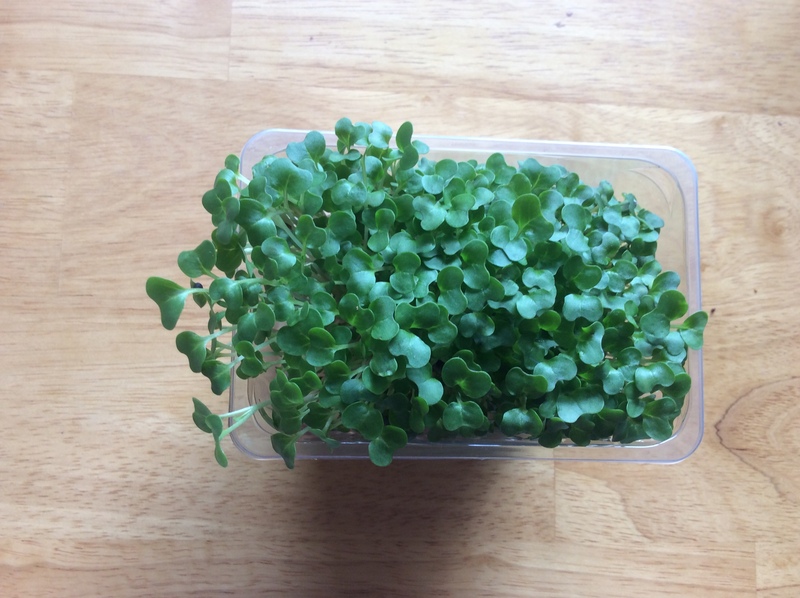 I did buy some cress at first, but I couldn’t find mustard-and-cress, so I decided to grow my own. Just a tiny sprinkle of seeds on damp paper towel or soil will grow a nice bunch of mustard-and-cress in only a few days. 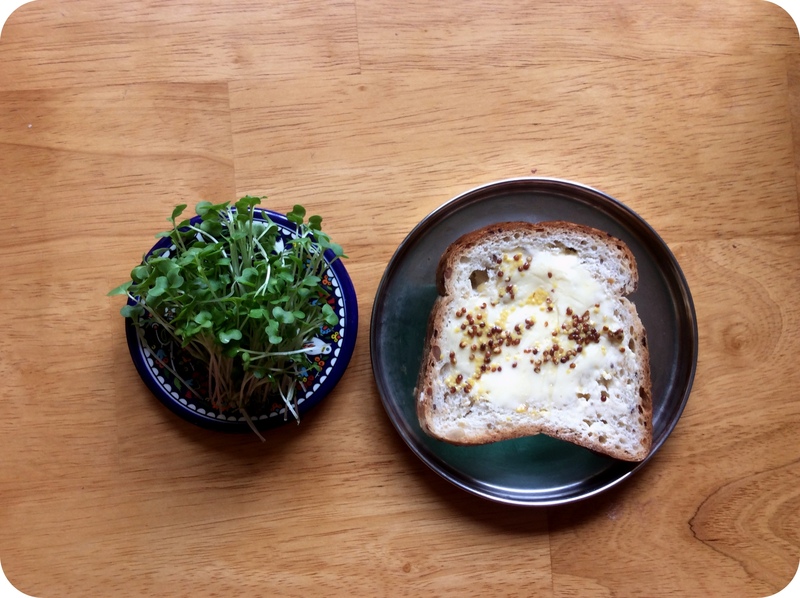 To start simple with mustard-and-cress, I took Milly-Molly-Mandy’s suggestion to try it with bread-and-butter. 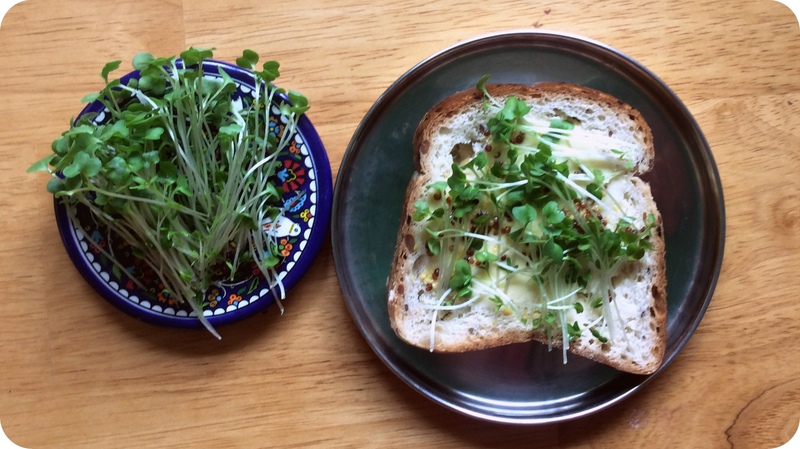 If you don’t have cress, you can always add whole grain mustard to mimic the flavor. You don’t need a recipe for bread and butter! Add the mustard and cress to taste. This needs to be served right away as the cress will wilt. 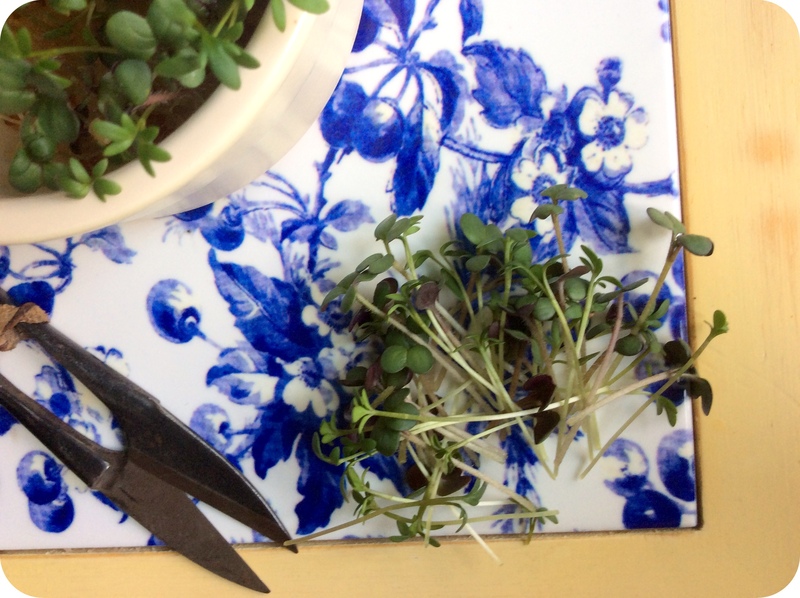 You probably can’t sell your cress for twopence, but you can grow it, snip it and grow some more!